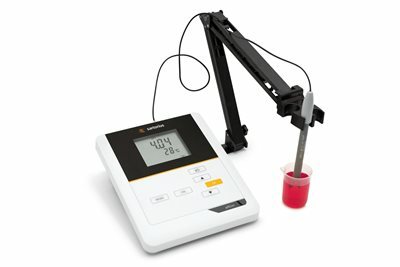 Pipette.com offers a selection of Sartorius pH meters along with a variety of electrodes for pH, conductivity, and dissolved oxygen meters. This line of pH meters are designed for professional use in a benchtop setting and provide accurate measurements. Whether you need a simple pH meter that will provide results on a large digital display for operators to read or precise data measurements including temperature, automatic calibration, and direct data transmission, there is a pH meter that will fit the needs of your laboratory. 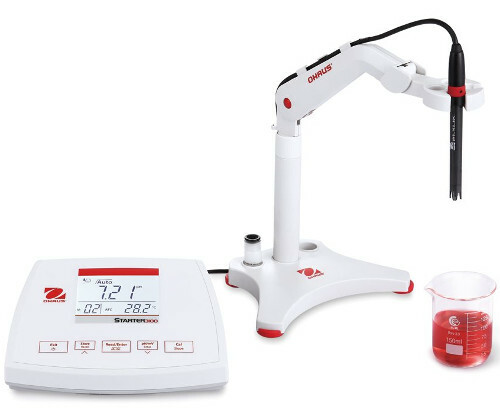 Not only do these models read the pH of samples, some advanced models offer advanced pH measurements, conductivity readings, and essentially provide an "all-in-one" device for your laboratory. Manufactured with German quality in Germany, you can rely on the stability and consistency of these pH meters from Sartorius. The most basic pH meter from Sartorius is designed to be simple-to-use with a classic interface that is extremely user friendly. Designed with intuitive icons and few buttons, this is the go to pH meter for laboratories are cost conscious or in a learning environment like a training or academic laboratory. Providing stability control and electCheck, this pH meter automatically recognizes not only different buffers, but it also automatically compensates for temperature variations and effects on pH levels. With easy calibration and an integrated temperature probe, this simple pH meter is a perfect fit for any laboratory. The pHCore is designed to provide fast, reliable pH measurements by applying advanced proprietary algorithm technology. Built with the same features as the pHBasic, the Sartorius pHCore comes with a few extra benefits. 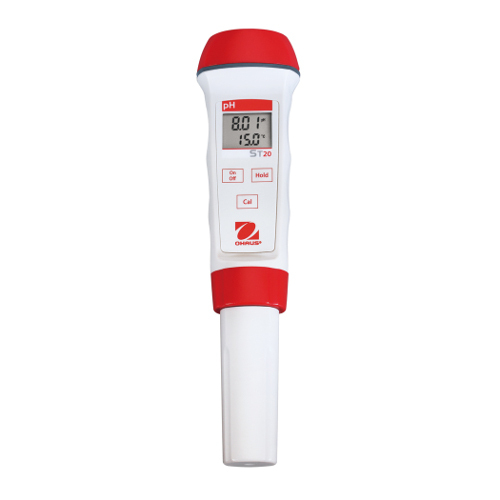 Not only does it have stability control, automatic buffer recognition, and automatic temperature compensation, this pH meter comes with AutoCal automatic calibration system. 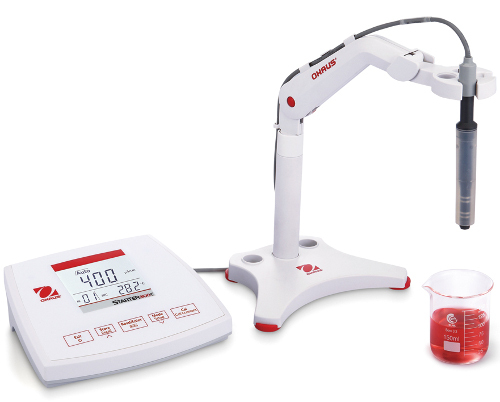 Designed to quickly navigate between samples and calibrate, the pHCore reduces the time of experiments by taking away the need to calibrate between readings while maintaining accurate, reliable measurements. Able to recognize up to 16 different standard buffers and featuring straightforward functions, there is no need to interpret a display or readings. The Sartorius Premium Pro series of pH meters are the most advanced meters provided by Sartorius. Recommended for diagnostic and research laboratories requiring utmost accuracy, the Premium Pro series from Sartorius provides professional level pH, conductivity, ISE and dissolved oxygen measurements. With wider ranges, 5-point calibrations, and German technology, you can rest assured that your results will never be more accurate. Meeting GLP regulatory requirements for documentation and providing wireless data transfer, the Premium Pro pH meter series is crucial for record keeping within the laboratory. Able to provide greater ranges of readings, more options such as conductivity, and direct data transmission, the Premium Pro pH meter from Sartorius is the Cadillac of pH meters that is a must have in any professional environment. The OHAUS Starter 5000 is a high-performance bench meter that is driven by a 1000 item library, 10 sensors for calibration storage, 8 predefined and 1 self-defined buffer groups, 3 endpoint modes and GLP mode. The color touchscreen operates like smartphones and tablet computers and provides simple operation for users including advanced features, such as one-touch toggling of measurement modes. Each model is equipped with a standalone electrode holder, USB port, IP54 housing and in-use-cover. Starter 5000 provides flexibility and ensures enduring operation. The OHAUS Starter 3100 includes intuitive software and three-point calibration, three buffer groups, automatic and manual endpoint functions, as well as a 99-item library. Each Starter 3100 is equipped with an adjustable standalone electrode holder and large backlit LCD display for a user-friendly experience. Recording measurement data is made easy through the RS232 which can be connected to peripheral devices such as printers or computers to the meter. The OHAUS Starter 2100 is designed with five clearly marked keys and user-friendly software. User friendly operation allows even the newest users to operate the meter with minimal training. Equipped with a built-in electrode holder provides uncomplicated and convenient operation. 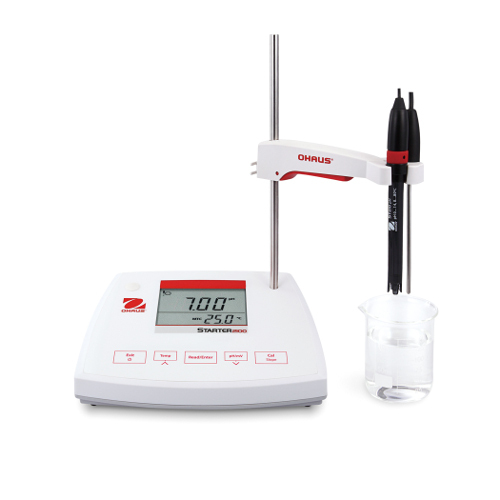 The large LCD display screen clearly displays results for easy tracking during measurements. The built-in auto buffer recognition, electrode condition icon, automatic temperature compensation and reference input all work to ensure your results are accurate. The OHAUS Starter 300 with the built in automatic and manual temperature compensation ensures your readings are accurate. In addition, a 30 measurement library stores data for future reference. The auto buffer recognition system stores calibration data and helps to avoid errors during the calibration process saving you time. Each Starter 300 pH meter is equipped with a meter stand, wrist strap for secure field use and IP54 housing. The Starter 300 is durable and prepared for use on the move. Performing pH has never been easier! Achieve rapid results with ease. 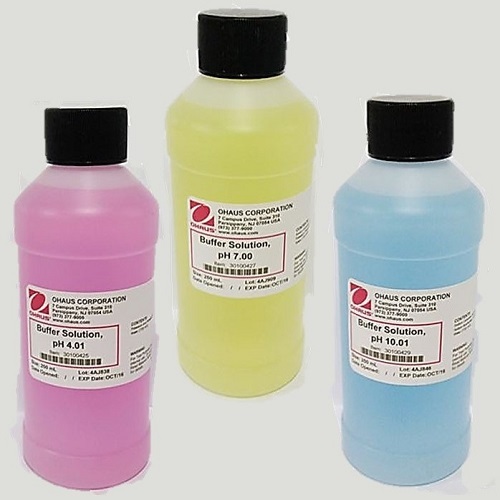 pHCore offers fast and reliable pH measurements thanks to advanced algorithm technology. Features like stability control, automatic buffer recognition, automatic temperature compensation, AutoCal ensures accurate measurements in a quick amount of time. The Sartorius Premium Pro Benchtop Meters (PR Series) is the most advanced meter to excel at your professional pH, conductivity, ISE and DO analyses. Be reassured, measurements have never been so accurate with German technology, wider ranges, auto cal and 5-point calibrations. OHAUS Starter Water Analysis Pen Meters are the perfect tool for on-the-go water testing – pH, ORP, conductivity, DO, salinity, TDS, temperature measurement. 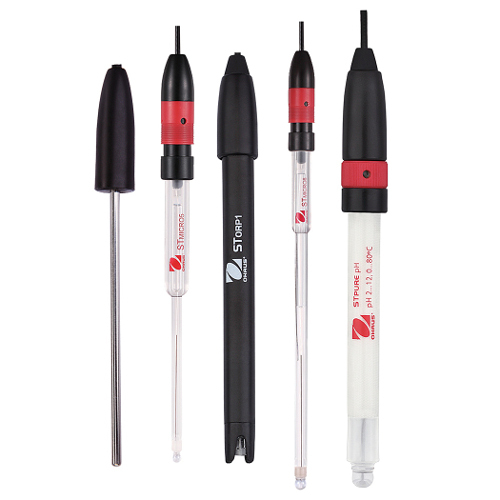 Starter Pen Meters are designed for durability and practicality. They have easily replaceable electrodes with a protective sensor caps, automatically shut off, and an ABS IP67 rated housing. 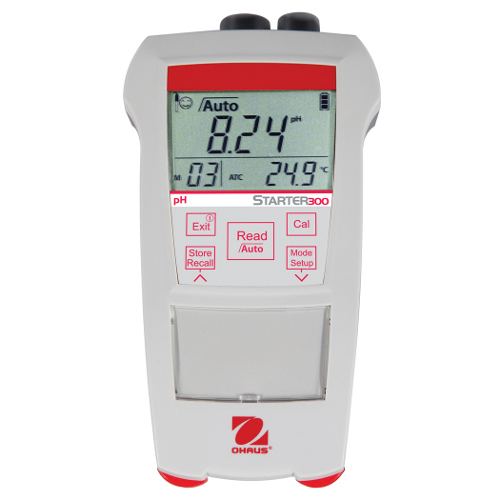 Starter 300D Portable Dissolved Oxygen Meters are versatile and portable, while maintaining accuracy and precision OHAUS is known for. The Starter 300D Portable Dissolved Oxygen Meter is palm-sized and great for work in or out of the lab. Special features include - immediately ready galvanic electrode, 30-slot measurement memory, auto temperature compensation. OHAUS Starter 300C Portable Conductivity Meters are durable in the field and withstand extreme elements. The meter features a 4-pole linear electrode. The electrode is designed with built-in protection from polarization and pollution. Starter 300C automatically compensates for temperature and has an adjustable temperature coefficient. It can test for TDS. 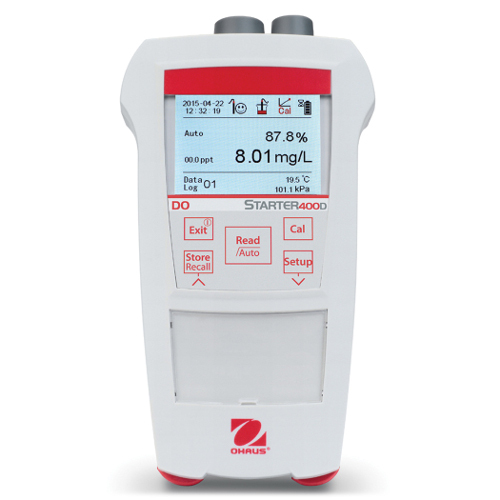 The OHAUSStarter 300 Portable pH Meter makes field pH measurements easy and precise. Calibration is easier since the meter automatically recognizes buffers and stores calibration data, reducing mistakes during start-up. Furthermore, the Starter 300 pH tester automatically compensates for temperature but also allows users to manually compensate if needed. OHAUS Starter Electrodes are for Starter bench and portable meters. The line includes, pH, reference, oxidation-reduction potential (ORP), conductivity, dissolved oxygen (DO), and temperature electrodes. 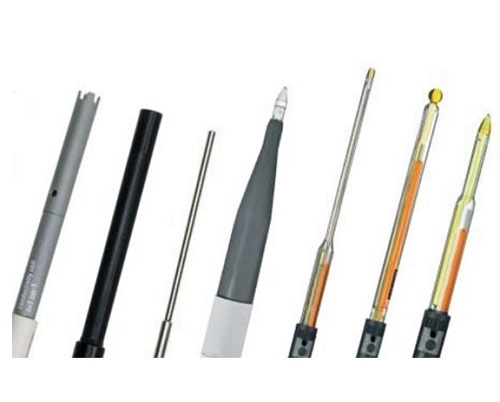 All electrodes include a temperature sensor which is used for the automatic temperature compensation. Units are constructed from plastic, glass, or metal. The OHAUS Starter 400D Portable Dissolved Oxygen (DO) Meter is a practical, affordable, low-maintenance dissolved oxygen meter. 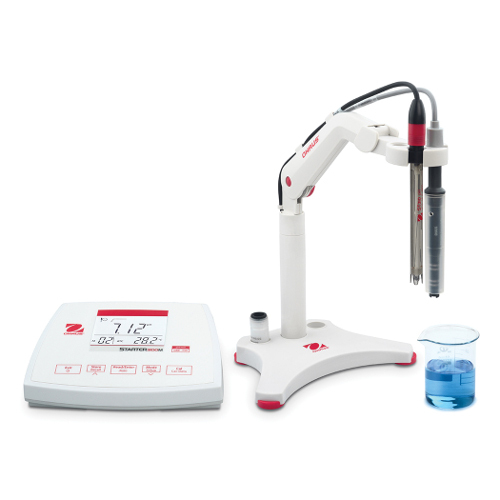 It is perfect for simple, yet accurate dissolved oxygen measurements. 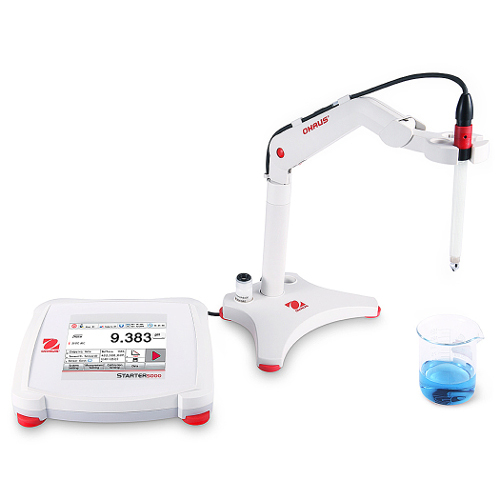 The optical or luminescent probe needs little maintenance and permits reading without warm-up or sample prep. The large backlit screen makes reading results easy, even in low light areas. The OHAUS Starter 2100 pH Bench Meter applies precision and accuracy to benchtop pH testing. 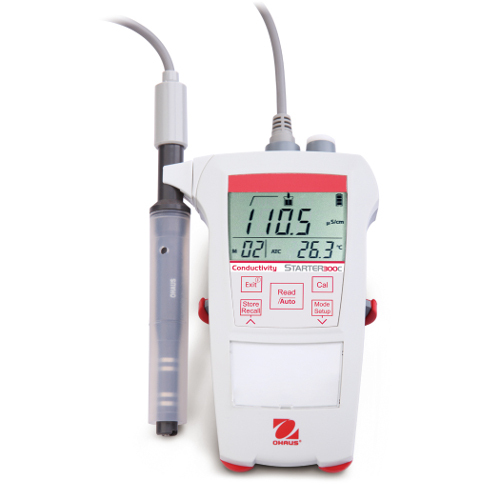 The pH device is intuitive to operate, cost-effective, and designed to ensure accurate measurement. Advanced software automatically compensates for temperature and automatically recognizes buffers. The electrode holder is included in the module for extra convenience. 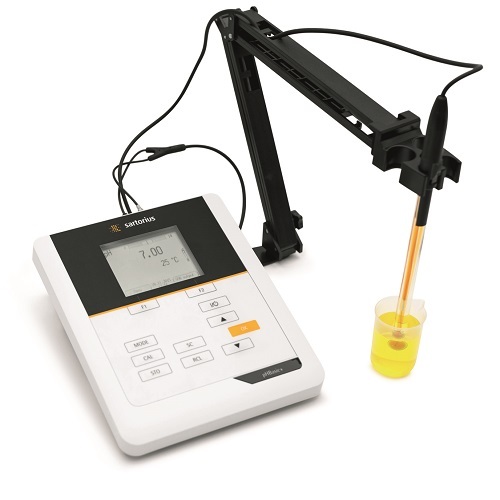 The OHAUS Starter 3100C Conductivity Bench Meter is designed for standard testing of conductivity, total dissolved solids (TDS), and salinity. 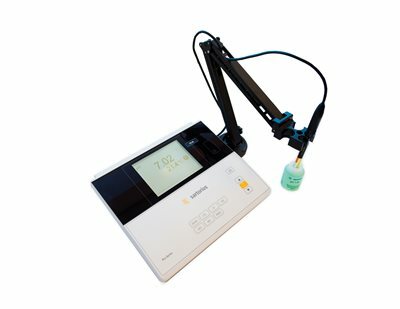 The conductivity meter is easy to use, and features a large backlit LCD display, an adjustable stand-alone electrode holder, and an intuitive 5-button interface. An RS232 allows the meter to connect to a computer or printer. The OHAUS Starter 3100 pH Bench Meter is designed to be a premium benchtop pH meter at a not-so premium cost. Software includes three-point calibration, three buffer groups, and automatic endpoint functions. A large backlit LCD display, an adjustable stand-alone electrode holder, and RS232 printer or computer connectivity make the device powerful and easy to use. 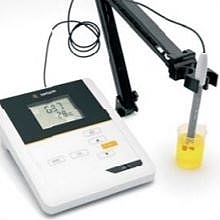 OHAUS Starter 3100M pH and Conductivity Bench Meters are versatile to perform pH, ORP, TDS, salinity, resistivity, and temperature measurements. The meter has automatic temperature compensation and buffer recognition and can work with six pH buffer groups or 5 conductivity standards. Users can toggle automatic or manual endpoints to ensure accurate measurements. The OHAUS Starter 5000 High Performance pH Bench Meter features advanced calibration options and a high-resolution color touchscreen for accuracy, precision, and ease-of-use. The memory bank can store up to 1000 individual measurements and the meter can continuously record at designated intervals. 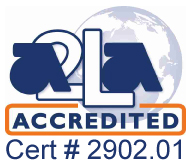 Users can choose to collect GLP standardized data for added ease.